The job description of a Master Teacher is to teach the Teaching staff, Assistant Teachers and Junior Teachers on how to provide quality teaching. 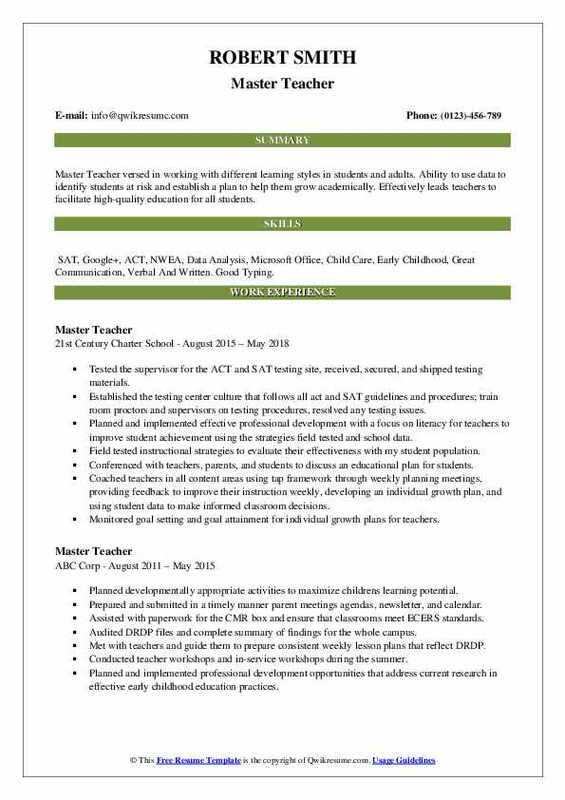 The job responsibilities that are listed on the Master Teacher Resume include the following – interacting regularly with teachers, assistants and other staff to prepare weekly plans, participating in staff meetings, preparing writing plans, supervising the teaching ways of daily teachers, visiting classrooms on regular basis, and performing all other additional duties as assigned. The things to consider and groom before becoming a Master Teacher include – being enthusiastic about the subjects they teach, being attentive and showing proficiency in designing strong curriculum, ability to learn further through continuous education, being a role model to other teachers and students and having the potential to connect well with students. A Master’s degree in specialized area of study is commonly seen on most of the resumes. 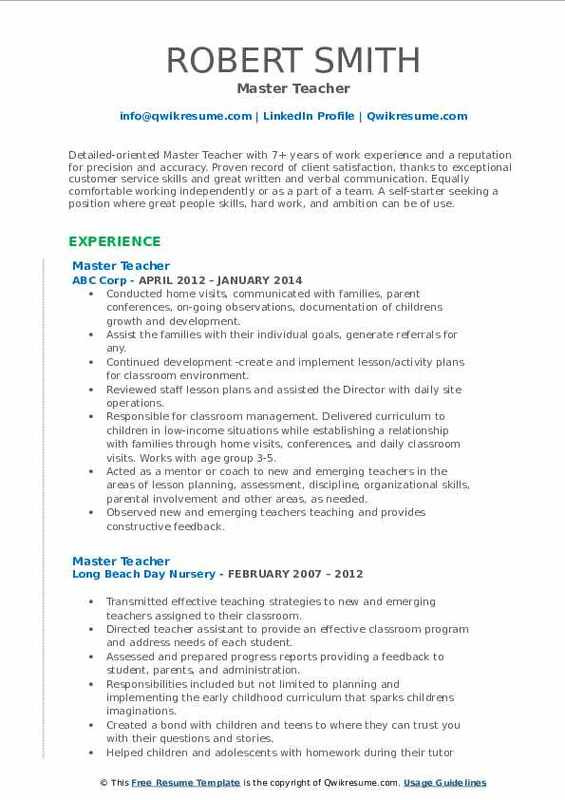 Objective : A Master Teacher who is highly proficient in communication skills. Demonstrates the ability to train others in specific tasks. Highly Proficient in Microsoft Word, Excel, Powerpoint, and Internet skills. Incorporates time management skills in all assignments in order to get them done on time. Communicated openly with children s parents about daily activities and behaviors. Classroom cleaning done daily taking out trash, vacuum, sweep after all meals and snacks. Followed a classroom schedule to ensure a fun and comfortable learning environment for the children. Tested and passed the van drivers training course required by DHS to transport children on field trips and to and from school every day. Had the privilege of caring for infants thru school age children daily. Collaboration with parents, administration, and support staff in order to develop specialized programs for special needs students. Summary : Master Teacher with over eleven years of professional experience in education and healthcare leadership. Proven track record of designing, building and implementing new and innovative programs. Effective communicator and relationship builder in diverse communities. Enthusiastic problem solver with a keen ability to assess situational challenges, develop action, plans and lead teams to meet or exceed targeted goals. Modeling and coaching the best practices for student academic growth and achievement. Evaluating 26 certified educators, using a best-practice multi-tiered rubric and process. Leading the data teams to evaluate student assessments and help teachers drive instruction. Teaching ESL, Reading, English Language Arts to at-risk students, grades 6-8. Supporting 150 students, which includes various levels of ESL instruction, intensive reading. Championed individual academic and social-emotional interventions for at-risk students by coordinating with community agencies and recruiting volunteers. Writing training program and trains volunteers for the youth foundation. Coordinating and administering the standardized testing school-wide. Summary : Master Teacher versed in working with different learning styles in students and adults. Ability to use data to identify students at risk and establish a plan to help them grow academically. Effectively leads teachers to facilitate high-quality education for all students. 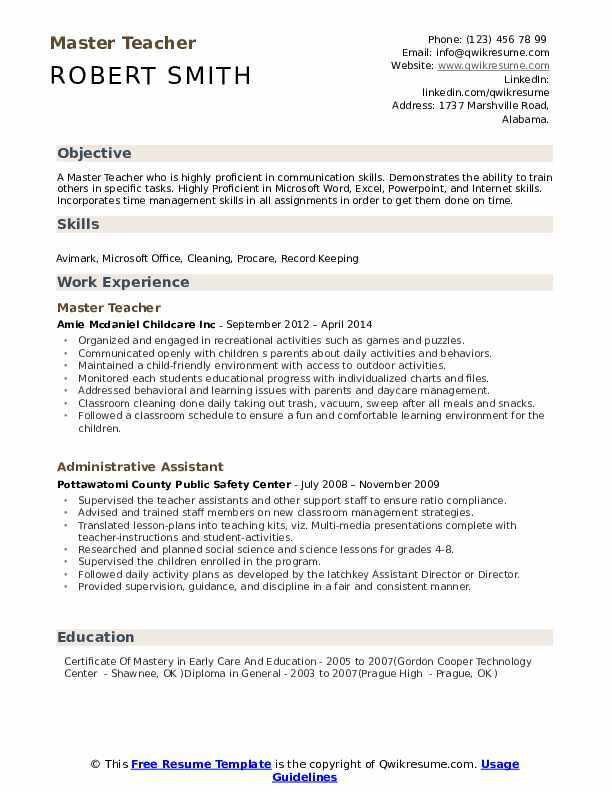 Skills : SAT, Google+, ACT, NWEA, Data Analysis, Microsoft Office, Child Care, Early Childhood, Great Communication, Verbal And Written. Good Typing. Tested the supervisor for the ACT and SAT testing site, received, secured, and shipped testing materials. Established the testing center culture that follows all act and SAT guidelines and procedures; train room proctors and supervisors on testing procedures, resolved any testing issues. Planned and implemented effective professional development with a focus on literacy for teachers to improve student achievement using the strategies field tested and school data. Field tested instructional strategies to evaluate their effectiveness with my student population. Conferenced with teachers, parents, and students to discuss an educational plan for students. Coached teachers in all content areas using tap framework through weekly planning meetings, providing feedback to improve their instruction weekly, developing an individual growth plan, and using student data to make informed classroom decisions. Monitored goal setting and goal attainment for individual growth plans for teachers. 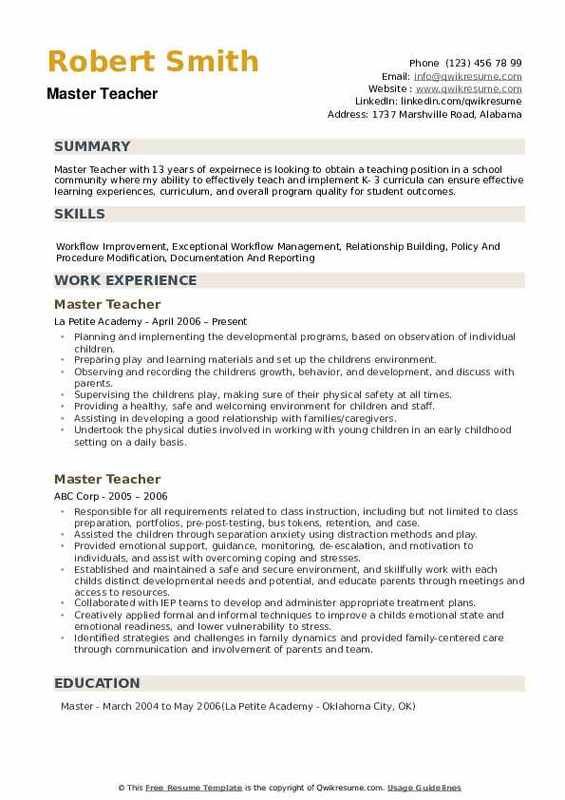 Summary : Detailed-oriented Master Teacher with 7+ years of work experience and a reputation for precision and accuracy. Proven record of client satisfaction, thanks to exceptional customer service skills and great written and verbal communication. Equally comfortable working independently or as a part of a team. A self-starter seeking a position where great people skills, hard work, and ambition can be of use. Conducted home visits, communicated with families, parent conferences, on-going observations, documentation of children's growth and development. Assist the families with their individual goals, generate referrals for any. Continued development -create and implement lesson/activity plans for classroom environment. Reviewed staff lesson plans and assisted the Director with daily site operations. Responsible for classroom management. Delivered curriculum to children in low-income situations while establishing a relationship with families through home visits, conferences, and daily classroom visits. Works with age group 3-5. Acted as a mentor or coach to new and emerging teachers in the areas of lesson planning, assessment, discipline, organizational skills, parental involvement and other areas, as needed. Observed new and emerging teachers teaching and provides constructive feedback. 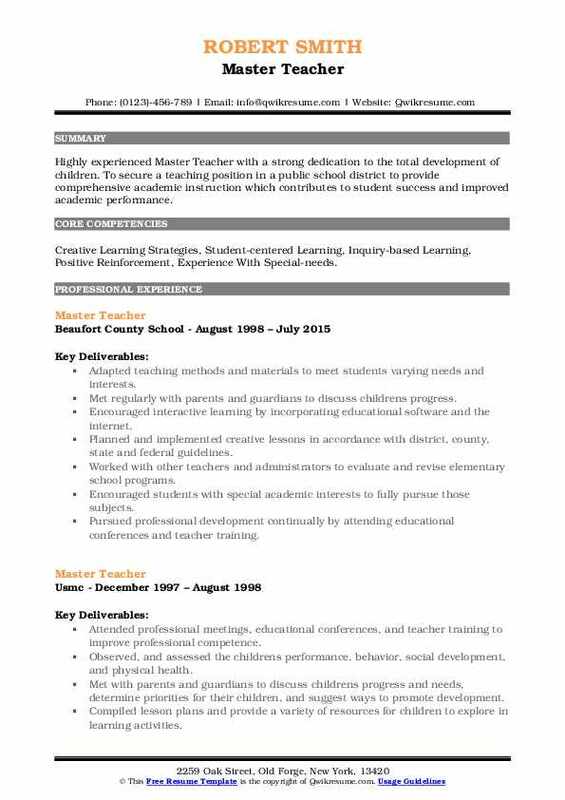 Objective : Dedicated and focused Master Teacher who excels at prioritizing and completing multiple tasks simultaneously. Specialize in customer service support serving children and families. I am committed to delivering high quality work with little supervision and able to do jobs effectively. Fast learner, strong written and verbal communicator, and self-motivated. Communicating with children's parents or guardians about daily activities, behaviors, and related issues. Keeping the records on individual children, including daily observations and information about activities, meals served, and medications administered. Supporting the children's emotional and social development, encouraging understanding of others and positive self-concepts. Identifying signs of emotional or developmental problems in children and bring them to parents or guardians attention. Assisting in preparing food and serving meals and refreshments to children. Instructing the children in health and personal habits, such as eating, resting, and toilet habits. Reading to children and teach them simple painting, drawing, handicrafts, and songs. Disciplining children and recommending or initiating other measures to control behavior, such as caring for own clothing and picking up toys and books. 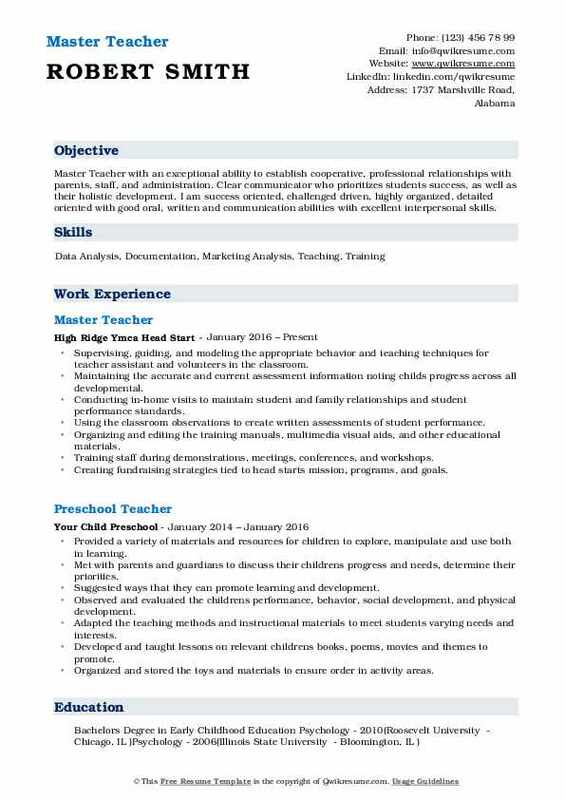 Objective : Master Teacher with an exceptional ability to establish cooperative, professional relationships with parents, staff, and administration. Clear communicator who prioritizes students success, as well as their holistic development. I am success oriented, challenged driven, highly organized, detailed oriented with good oral, written and communication abilities with excellent interpersonal skills. Supervising, guiding, and modeling the appropriate behavior and teaching techniques for teacher assistant and volunteers in the classroom. Maintaining the accurate and current assessment information noting child's progress across all developmental. Conducting in-home visits to maintain student and family relationships and student performance standards. Using the classroom observations to create written assessments of student performance. Organizing and editing the training manuals, multimedia visual aids, and other educational materials. Training staff during demonstrations, meetings, conferences, and workshops. Creating fundraising strategies tied to head starts mission, programs, and goals. Researching possible grants and creating proposals to submit along with grant applications. 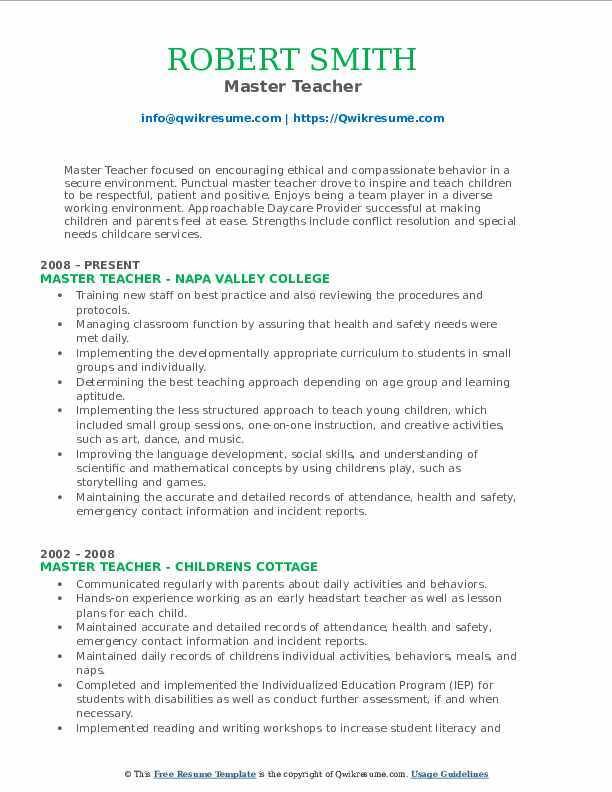 Summary : Master Teacher focused on encouraging ethical and compassionate behavior in a secure environment. Punctual master teacher drove to inspire and teach children to be respectful, patient and positive. Enjoys being a team player in a diverse working environment. Approachable Daycare Provider successful at making children and parents feel at ease. 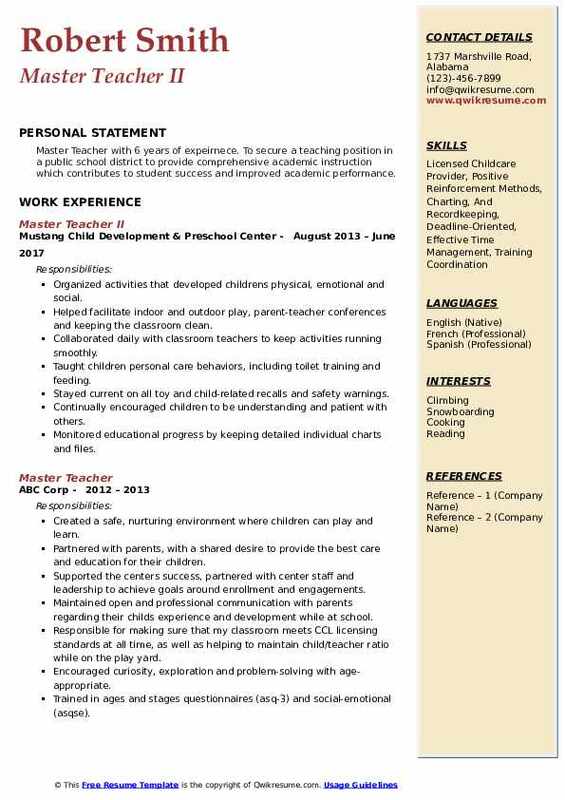 Strengths include conflict resolution and special needs childcare services. Training new staff on best practice and also reviewing the procedures and protocols. Managing classroom function by assuring that health and safety needs were met daily. Implementing the developmentally appropriate curriculum to students in small groups and individually. Determining the best teaching approach depending on age group and learning aptitude. Implementing the less structured approach to teach young children, which included small group sessions, one-on-one instruction, and creative activities, such as art, dance, and music. Improving the language development, social skills, and understanding of scientific and mathematical concepts by using children's play, such as storytelling and games. Maintaining the accurate and detailed records of attendance, health and safety, emergency contact information and incident reports. Summary : Highly experienced Master Teacher with a strong dedication to the total development of children. To secure a teaching position in a public school district to provide comprehensive academic instruction which contributes to student success and improved academic performance. Skills : Creative Learning Strategies, Student-centered Learning, Inquiry-based Learning, Positive Reinforcement, Experience With Special-needs. Adapted teaching methods and materials to meet students varying needs and interests. Encouraged students with special academic interests to fully pursue those subjects. Pursued professional development continually by attending educational conferences and teacher training. Headline : Master Teacher with 6 years of expeirnece. 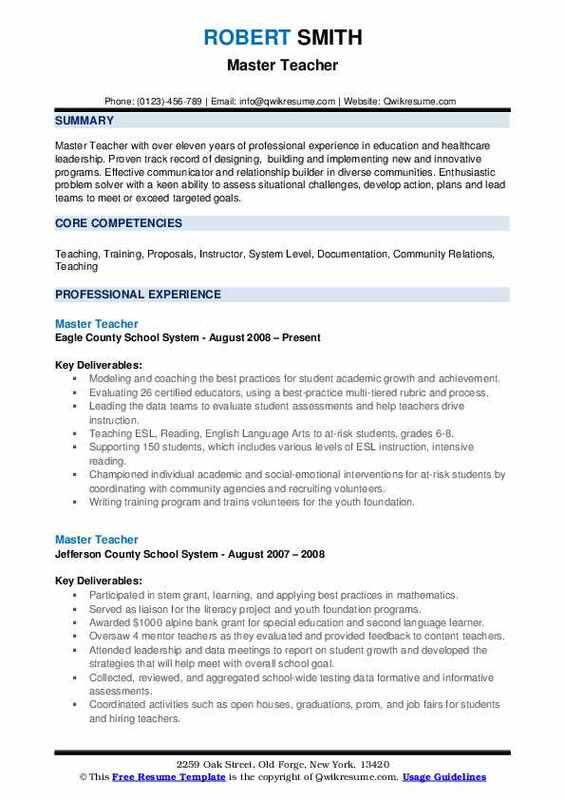 To secure a teaching position in a public school district to provide comprehensive academic instruction which contributes to student success and improved academic performance. Organized activities that developed children's physical, emotional and social. Helped facilitate indoor and outdoor play, parent-teacher conferences and keeping the classroom clean. Taught children personal care behaviors, including toilet training and feeding. Stayed current on all toy and child-related recalls and safety warnings. Continually encouraged children to be understanding and patient with others. Monitored educational progress by keeping detailed individual charts and files. Instructed children in health and personal habits including eating, resting and toilet habits. Offered a stimulating curriculum that accommodated all learning styles. 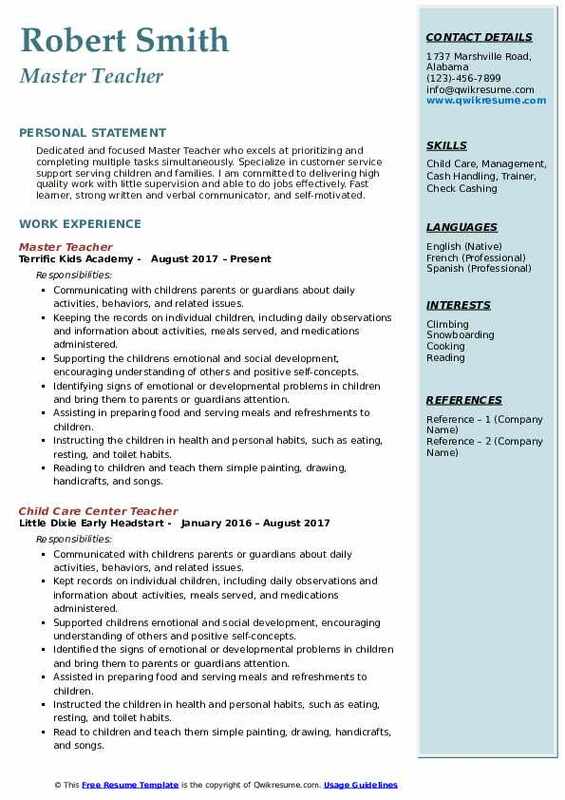 Summary : Master Teacher with 13 years of expeirnece is looking to obtain a teaching position in a school community where my ability to effectively teach and implement K- 3 curricula can ensure effective learning experiences, curriculum, and overall program quality for student outcomes. Planning and implementing the developmental programs, based on observation of individual children. Preparing play and learning materials and set up the children's environment. Observing and recording the children's growth, behavior, and development, and discuss with parents. Supervising the children's play, making sure of their physical safety at all times. Providing a healthy, safe and welcoming environment for children and staff. Assisting in developing a good relationship with families/caregivers. Undertook the physical duties involved in working with young children in an early childhood setting on a daily basis. Read stories to the children and taught them painting, drawing, and crafts.